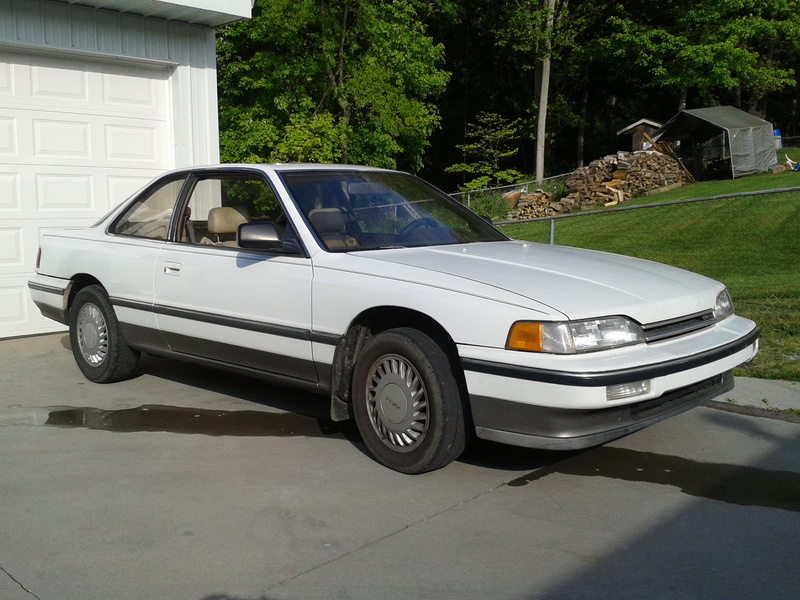 The car is fairly solid, with minor rust and body damage as is to be expected with a 25 year old car. The engine feels pretty strong, however, there are some oil leaks. Pretty certain the valve cover gaskets are leaking, as well as the oil pump gasket. Its a pretty decent leak. The 5 speed transmission feels pretty tight as well. We hope to leave that as is and that it will last all race. The entire front suspension needs replaced as all the bushings and ball joints are shot! We are going to replace the upper control arms (since you can’t just replace the upper control arm bushings on this car), the tie-rod-ends, and lower ball joints on both the passenger and drivers sides; with OEM equivalent of course. The rear of the car seems ok. I don’t think we will have to replace anything there (really hopes so). We will probably end up cutting the stock springs to lower the ride height and also increase our spring rate. The interior of the car was shot! I mean there were more tears in the leather than there were areas without tears. Not that that really matters since this car will be completely gutted. I mean totally and utterly gutted. Everything that doesn’t make this car move or stop will be removed. The sunroof will be coming out and a aluminum sheet will be welded in place as per the rules. All of the glass will be removed, with the exception of the windshield of course. The dash will be removed and we will simply mount some gauges and kill switch to the roll cage. Once gutted, a roll cage will be custom made and installed by driver Donnie Shealy. We will try and remove as much of the undercoating as well. I know that will be a painstaking process, but if we can get 50+ pounds removed then it will be worth it. In order to be safe and not burst in to flames on track, the 24 Hours of Lemons and Chump Car World Series (CCWS) have certain safety items that must be installed. I already mentioned the kill switch; the kill switch must shut off all power to the car and completely kill it, and must be accessible by the harnessed in driver and safety personnel. We must also have a fire extinguisher mounted in the car that is also within reach of the driver. Another must have is a racing seat and 5 point harness, so we will get those too. Another safety modification that isn’t mandatory but recommended is a fuel cell. I really want to install a 15-20 gallon fuel cell in the trunk, and then remove the stock tank. Whether or not we get to depends on the budget. Brakes are also considered safety items as they help us avoid other morons… er I mean drivers. Lemons says brakes are free, and CCWS says they can be replaced at two times the cost of OEM without adding to your total competition value (I’ll get to that later). We will also be adding brake ducts to help keep the rotors cool and extend our pad life. Exhaust is also free downstream of the headers. For us, we are just going to fabricate the exhaust so that it exits on the passenger side behind the front wheel. We just have to keep it below 93 decibels. Reliability is the key to finishing an endurance race. With that in mind, I want to make sure the cooling system is up to the task. Ideally that would mean replacing the stock radiator with a new higher flowing unit, but that will add to our total competition value in the CCWS. So depending on where our CCWS AIV (i’ll get to that one later too) ends up, we may have to leave the stock system in place. I would also like to add an oil cooler, but again it depends on the budget. All of the hoses will be replaced and double clamped. When at the track we can only use water as our coolant. We may just end up having to vent the hood by cutting some holes in it to help airflow. We will probably run the stock 15×5.5 wheels, wrapped in either Dunlop Direzza Star Specs, or Falken Azenis RT-615K’s. Stay tuned for updates, and pictures of the build. As you can see to the right, we have 8 months left before our anticipated first race.